Kilimanjaro (formerly Kaiser-Wilhelm-Spitze) is a mountain in northeastern Tanzania. It includes the highest peak in Africa at 5,895 meters. It is a giant stratovolcano, not currently active, with fumaroles that emit gas in the crater on the main summit of Kibo. Scientists concluded in 2003 that molten magma is just 400 meters below the summit crater. Although new activity is not expected, there are fears the volcano may collapse, causing a major eruption similar to Mount St. Helens. Several collapses and landslides have occurred on Kibo in the past, one creating the area known as the western breach. Although there is no recorded history of eruptions, local legend speaks of activity around 170 years ago. The highest point is Uhuru Peak on the volcano Kibo, 5,895 metres. As the highest point in Africa, Uhuru Peak is one of the Seven Summits. The summit was first reached by the Marangu army scout, Johannes Kinyala Lauwo who climbed it nine times before realising there was a crater. Lauwo served as a guide for the first ascent by nonindigenous climbers, German Hans Meyer and Austrian Ludwig Purtscheller, on October 6, 1889. Two other peaks are also extinct volcanoes: Mawenzi (5,149 metres), the third highest peak in Africa (after Mount Kenya) and Shira (3,962 m). Johannes' Notch is named after Lauwo. In 1989 Lauwo was presented with a house at Ashira Marangu by the West German government in recognition of his role on the Meyer expedition. His relative, Trilas Lauwo (1952- ) was the first Tanzanian woman to reach the summit via the Mweka route in 1972. At 19,340 ft above sea level, Kilimanjaro in Tanzania is the highest mountain in Africa and the highest free-standing mountain in the world, Kilimanjaro dominates its landscape unlike any other mountains and offers the world's most impressive sights and adventure while on a mountain climbing expedition. An ascent of Mawenzi requires rock climbing and/or snow/ice climbing skills. The climb to Uhuru Peak is considered to be a relatively straightforward endeavour; however, ample time must still be provided for proper acclimatization to prevent altitude sickness. The three easiest routes, Marangu, Rongai and Machame can be climbed by a person of good health, and require no mountaineering experience. Many who climb employ altitude-sickness medication and find this to be helpful in preventing the pounding headaches that plague many travellers. Those who travel on the Marangu route usually take 4-5 days to complete their climb. Huts with cooking facilites, bathrooms, and (sometimes) electricity are available at the end of each day's journey. The final part of the climb, from Kibo hut at 15,500 ft. to the summit, is generally undertaken at night, because the scree is frozen together, making the climb significantly easier. Gilman's Point, on the rim of the crater, but about 1½ hours hike from Uhuru, is attained at 5:00 - 6:00 am; those who have the strength to continue may then hike on to Uhuru in the growing sunlight and rising temperatures. Another route is the Western Breach, which is much more technical in nature. Annually, approximately 15,000 people attempt to climb the mountain, of whom 40% reach the summit.At the summit, there is a sign posted by the Tanzanian government. "Congratulations! You are now at Uhuru Peak, Tanzania, 5,895 m. AMSL. Africa's Highest Point. World's Highest Free-Standing Mountain. One of World's Largest Volcanos. Welcome." While the volcano appears to be dormant on the inside, events on top of the mountain have been drawing global attention recently. The glaciers that have covered the top of the mountain for the past 11,700 years are rapidly disappearing. Over the past century, the ice cap volume has dropped by more than 80%. In 2002, a study led by Ohio State University ice core paleoclimatologist Lonnie Thompson predicted that ice on top of Africa's tallest peak would be gone between 2015 and 2020. In March 2005, it was reported that the peak was now almost bare, for the first time in 11,000 years. A comparison of ice core records from Kilimanjaro suggests that conditions similar to those of today have not existed since then. Though the cause of the reduction in ice volume is in dispute, the loss of the Kilimanjaro ice fields will carry significant climatological and hydrological implications for local populations who depend on water from the ice fields during the dry seasons and monsoon failures. As of January 2006, the Western Breach route has been closed by the Tanzanian government following a rockslide which killed four people at Arrow Glacier Camp. The rockslide is believed to have been caused by frost action in an area which is no longer permanently frozen. After the Western Breach route was closed in January 2006, many expeditions that had intended to use this route have instead used the Lemosho/Barafu route. As the Western Breach route, this route starts to the west and goes up the Shira Ridge towards Lava Tower. Instead of going up to Arrow Glacier camp and the breach, however, this route goes around the southern edge of Kili towards Barafu camp. From Barafu Camp, around 15,200 altitude, a nighttime summit attempt is usually attempted. Kenya is a land of contrast offering classic camping and lodge safaris through the savannahs to the Seventh Wonder Masai Mara, Great Rift Valley Lakes, Mount Kenya, Amboseli, Samburu, Tsavo, and the pristine white sandy beaches of the Indian Ocean covering Lamu,Kilifi, Malindi, Mombasa, Diani and Watamu. Twelve small (and rapidly shrinking) glaciers may be found scattered among the complex of seven summits. 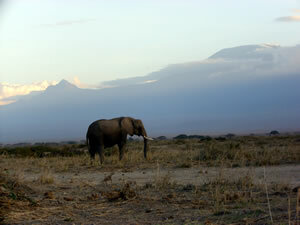 The area around the mountain is protected in the Mount Kenya National Park. The Kikuyu people believe that their supreme being Ngai lives on Mount Kenya, which they call Kirinyaga. The missionary Johann Ludwig Krapf was the first European to report a sighting of Mount Kenya, in 1849. The first recorded ascent of Mount Kenya was made by Halford John Mackinder, C. Ollier and J. Brocherel on 13 September 1899. The highest point (Batian) is a technical climb; the classic Diamond Couloir climbing route is a Grade IV of about 20 pitches, up to YDS 5.9 in difficulty. Nelion was first climbed by Eric Shipton in 1929, and Shipton and Bill Tilman completed the traverse of ridge between the two highest peaks. Point Lenana, at 4,985 metres (16,335 ft), can be reached by a hiking trail. 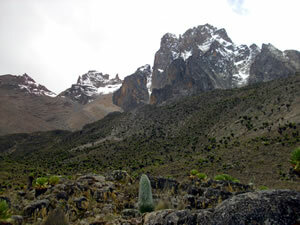 Mount Kenya is best climbed in January or February on the south side and August or September on the north side. Mount Kenya is home to one of the Global Atmosphere Watch's atmospheric monitoring stations. Rising from the jungles that border Uganda, Mt Elgon is an impressively craggy extinct Volcano. This remote region makes for interesting trekking through deep forest and across broad moorlands. There is plenty of wildlife and plenty to discover. The peaks are ideal for climbing, and shelter a series of warm geothermal springs. The mountain has many caves for the visitor explore. In these caves, known collectively as Elkony, ancient cave paintings decorate the walls, and bats and rock hyrax are found among the winding passageways. The most famous cave of all is Kitum, where each night Elephant herds gather and begin a slow procession deep into the mountain. The elephants make their way through the caves, following well worn paths made by generations before them. Deep in the cave, they use their tusks to excavate the walls, seeking the natural salt which they lick from the scarred rock. Witnessing this incredible sight is just one of the many wonders of Elgon. The mountain is named after the Elgonyi tribe, who once lived in huge caves on the south side of the mountain. It was known as "Ol Doinyo Ilgoon" (Breast Mountain) by the Maasai and as "Masawa" on the Ugandan side. Mt. Elgon consists of five major peaks:"Wagagai" (4,321m), being in Uganda, "Sudek" (4,302m or 14,140ft) in Kenya, "Koitobos" (4,222m or 13,248 ft), a flat topped basalt column (Kenya), "Mubiyi" (4,211m or 13,816 ft), "Masaba" (4,161m or 13,650 ft). In 1896, C.W. Hobley became the first European to circumambulate the mountain. Kmunke and Stigler made the first recorded ascent of Wagagai in 1911. F. Jackson, E. Gedge, and J. Martin made the first recorded ascent of Sudek in 1890. The main peak is an easy scramble and does not require any mountaineering equipment. Ngwarisha, Makinyen, Chepnyalil and Kitum lava tube caves. Kitum Cave is over 60 metres wide and penetrates 200 metres. It is frequented by wild elephants who lick the salt exposed by gouging the walls with their tusks. It became notorious for its association with the Ebola virus after two people who had visited the cave (one in 1980 and another in 1987), both contracted the disease and died. The mountain soils are red laterite. The mountain is the catchment area for the several rivers such as the Suam River, Nzoia River and the Turkwel River, some of which flow to Lake Victoria and others in Lake Turkana. The town of Kitale is in the foothills of the mountain. The area around the mountain is protected by two Mount Elgon National Parks - one on each side of the international border. Some rare plants are found on the mountain, including Ardisiandra wettsteinii, Carduus afromontanus, Echinops hoehnelii, Ranunculus keniensis, and Romulea keniensis. The Ruwenzori Mountains - or the Mountains of the Moon - rise to very high altitudes along the border area between the western Uganda and Zaire in central Africa. Apart from being one of the main sources of the Nile, they are among the strangest and most mysterious mountains in the world. The lower parts of Ruwenzori are covered with dense tropical rain forest separated by powerful rivers. Everywhere, there is an immense fertility due to the very heavy rainfall all year round (as an average, it rains 300 days during the year). Trekking here is a tough walk for hours by hard accessible trails blocked by fallen trees, crossing muddy swamps. The forest is very different in appearance and species. Some of the remarkable vegetation in the lower regions consist of plenty of 2-3 meter high fern trees and extensive areas covered by thousands of 10 meter high bamboo trunks swinging over your head. Sometimes the trail disappears, and the direction leads you through big, muddy swamps. It's quite a good comparison to imagine, that you have just left your time machine after a long time travel back to a remote geologic age. Most of the vegetation feels unfamiliar and over-sized, and the whole landscape makes you think of the earth in a prehistoric time. You can find legends about these mountains all the way back to the beginning of the history of mankind. The trade travels of the old egyptians gave birth to rumours about the source of the Nile as a huge, snow-covered mountain in the heart of Africa. However, bacause of the lack of exact information, the Mountains of the Moon remained in the world of legends and dreams. When Ptolemaeus made his famous world map in the 2.nd century A.C., he put a huge mountain in the middle of Africa and described it as "the Mountain of the Moon, feeding the source lakes of the Nile with its snow". Both the description and the position on the map is astonishingly correct compared to the geographic knowledge at that time, and although Ruwenzori is drawn on newer maps up through history, none of these show their position as correct as the map of Ptolemaeus. As the centuries passed, the Mountains of the Moon were considered to be something unreal - and honestly, who would ever believe anybody in older times, who started talking about snow-covered mountains under the burning sun of equator? Even a long time after the legendary expeditions to Central Africa started, Ruwenzori remained a mystery. In 1864, Baker forced his way along the Nile to Lake Albert, and in 1876, Stanley reached Lake Edward - But neither of them realized, that between these 2 lakes, there was a 150 km long mountain chain with summits higher than 5.000 meters. The explanation of this failure is, that Ruwenzori as good as always is hidden by mist and clouds. According to the local language of the natives, "Ruwenzori" means "The King of Mists" or "The Rain Maker". The first time Ruwenzori was seen by humans outside Africa was in 1888 at Lake Albert, at Stanley's second visit, and it happened accidentally. When Stanley after a month's stay left the west bank of Lake Albert, one of the locals made him aware of a strange phenomenon in the horizon. The african called it "A mountain made of salt". The secret "Mountains of the Moon" were hereby discovered by non-african people. A subject of concern in recent years has been the impact of climate change on Rwenzori's glaciers. In 1906 the Rwenzori had 43 named glaciers distributed over 6 mountains with a total area of 7.5 km²., about half the total glacier area in Africa. By 2005, less than half of these survive, on only 3 mountains, with an area of about 1.5 km². Recent scientific studies such as those by Dr Richard Taylor of UCL have attributed this to global climate change, and investigated its impact on the mountain's vegetation and biodiversity. The highest point is Uhuru Peak on the volcano Kibo, 5,895 metres. As the highest point in Africa, Uhuru Peak is one of the Seven Summits. The summit was first reached by the Marangu army scout, Johannes Kinyala Lauwo who climbed it nine times before realising there was a crater. Lauwo served as a guide for the first ascent by nonindigenous climbers, German Hans Meyer and Austrian Ludwig Purtscheller, on October 6, 1889. Two other peaks are also extinct volcanoes: Mawenzi (5,149 metres), the third highest peak in Africa (after Mount Kenya) and Shira (3,962 m). Johannes' Notch is named after Lauwo. In 1989 Lauwo was presented with a house at Ashira Marangu by the West German government in recognition of his role on the Meyer expedition. His relative, Trilas Lauwo (1952- ) was the first Tanzanian woman to reach the summit via the Mweka route in 1972.